According to the legend, a certain Pazzino di Ranieri de'Pazzi took part in the recovery of the Holy Sepulcher. He headed people from Florence. For his courage shown in battles, the knight was awarded with three chips of stone from the Holy Sepulcher of Christ. Pazzino brought them to Florence by Easter celebration. The cart carried not only the stones, but also the fire ignited by them. Since that time, a dove which ignites the fire flew out of the Santa Maria del Fiore Cathedral every year on Easter Day. The Florentines used to take new Easter fire to light up their home fireplaces. By this way, people symbolically cleansed them. The tradition has been gradually getting more and more creative realization. The cart hasturned into a sophisticated ark, artistically decorated. Under the accompaniment of costumed musicians and standard bearers, it moves around the city in the direction of Piazza del Duomo square. A rocket has replaced a living dove; and the Holy purifying fire turned into bright fireworks. Festive ceremony begins at Santi Apostoli Church, where the priest takes three stones brought by Pazzino, and strikes fire to ignite the Easter Candle. The ceremonial pageant delivers the Holy Fire to the worship at the sanctuary of the Santa Maria del Fiore Cathedral. While “Glory”is heard at the service, a dove-shaped rocket is ignited. It flies through the Cathedral and a part of the Square to ignite the so called “cart of the Holy Fire”. The Florentines watch the ceremony of “Scoppio del Carro” with great interest and some caution. According to the belief, if the fire ignites, the following year will be successful. Perhaps, this is just a prejudice, but when in the year of 1966 the dove didn't manage to finish the ceremony, the flood stroke the city. “Scoppio del Carro” is one of the most impressive folk traditions preserved in Tuscan culture. To check it, it's worth visiting Florence on Easter days. 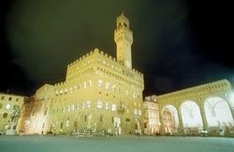 Florence is not only geographical but also a cultural heart of Tuscany. The number of masterpieces of this city is endless. The reason for that is that the most talented artists like Dante, Boccaccio, Brunelleschi, Giotto, Donatello, Botticelli, Michelangelo, da Vinci, Rafael and many other genius masters lived and worked here. They say that Florence has three hundred and fifty most brilliant artists out of thousand in Europe. You will be captivated nearly by every inch of Florence: streets and squares, bridges and the coastline, interior and exterior decorations.